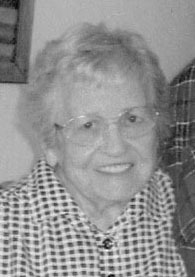 PROSPECT, Pa. — Alice Mae Vollnogle, 91, of Grindel Rd., formerly of Lisbon, passed away Sunday, March 17, 2019 at her son’s home in Prospect. Born Sept. 13, 1927 in Chester, W.Va., she was a daughter of the late Hollie and Alice Elizabeth (Henderson) Bosworth. A 1945 graduate of East Liverpool High School, she was a homemaker and had worked through Lisbon Senior Aid at the Laundry Barn in Lisbon. She was a former member of Lake Mount Church of Christ. She was preceded in death by her husband, Kenneth L. Vollnogle; her sister, Helen Andrews; brothers, George, Jack, Richard, John, infant brother, Leonard Bosworth; and granddaughter, Charlene Vollnogle. Survivors include her sons, Charles Vollnogle of East Fairfield; Jeff and Kim Vollnogle, both of Lisbon; and Toby Vollnogle of Prospect; sisters, Linda Rogers of North Royalton, Ohio and Dollie Marinucci of Kimbolton, Ohio; brothers, Howard and Arthur Bosworth, both of East Liverpool; 10 grandchildren; 21 great-grandchildren; and four great-great-grandchildren. Funeral services will be held at 11 a.m., Thursday, March 21, 2019 at the Eells-Leggett-Stauffer Funeral Home with Rev. Brian Brown officiating. Burial will follow in the Lisbon Cemetery. The family will receive friends from 2-4 and 6-8 p.m., Wednesday at the funeral home.